Squeak-toy and Bob. Photograph by Suzanne Shoemaker. On February 26 I was enjoying an unusually leisurely Sunday when I received a call from Officer Douglas of Frederick County Animal Control. He had picked up an injured hawk and wanted to know if I could receive it. Half hour later he delivered to me a juvenile male Red-shouldered Hawk. It was immediately obvious that the little guy’s injuries were serious. His left foot had several punctures, and the whole foot was infected and swollen to the point of disfigurement. His wounds were probably a week old, and he was severely dehydrated and emaciated from being unable to hunt and take care of himself over that time. The puncture wounds appeared to be the work of a prey animal; most likely a squirrel. If the hawk does not land on the squirrel’s head and kill it quickly, the squirrel can get the upper hand. Fighting back with all the power of its nut-cracking teeth and jaws, a squirrel can be a formidable opponent to a small hawk such as a Red-shouldered. This hawk, in his youthful naiveté, had apparently made the mistake of holding on too long and his would-be prey got a hold of him. I started him on antibiotics and pain meds, cleaned his wounds, and began fluid therapy to rehydrate him before I could offer him any food. That same afternoon I received another male Red-shouldered Hawk (bringing my Red-shoulder count up to five), an adult, transferred from Second Chance Wildlife Center in Gaithersburg, MD. His history was another mysterious case. He was found in a yard in Chevy Chase, MD on Feb. 17, where he had been seen all day, “flapping his wings but not flying.” The examination suggested that he had suffered an impact. There was blood in his trachea (wind pipe), and he was very weak and unsteady on his legs, preferring to rest on his hocks. Like the juvenile, he had probably been down for some time, because he too was emaciated. Second Chance had treated him with non-steroidal anti-inflammatory (NSAID) drugs and fluid therapy, and after ten days he had regained some of his strength, was eating on his own, and ready for outdoor housing. I placed him in the mew with Squeak-toy. I call Squeak–toy’s new roommate “Bob”, because of the strange bobbing movements he made with his head when I first put him outdoors. His legs were unsteady and he wobbled when he landed on a perch. He would raise and lower his head, looking at his feet, to maintain his balance. Bob is still not 100 percent, but his condition is greatly improved. When he first went out, he lacked strength in his wings as well as his legs. His flight was balanced, but he could not gain enough height to fly to the highest perch. Now he is flying circles over me when I enter, and landing on stronger, sturdier legs. Speaking of making it to the highest perch, Squeak-toy is getting there now too! I am pleased and proud that he is still making progress on his own. The morning after I received the two hawks, I got a call from Wes. 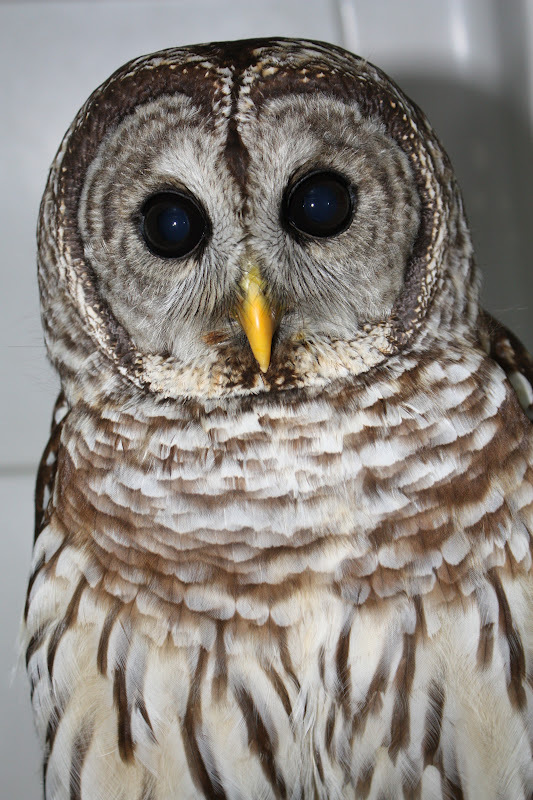 Wes had rescued a Barred Owl from the side of Interstate 70 in Mount Airy, MD, where he exited on his way to work. He continued driving to work where he modified a box, placed the owl in it, and called Animal Control to pick it up. Then he found Owl Moon Raptor Center on the MD Dept. of Natural Resources website and decided to cancel the call to Animal Control and bring the owl to Owl Moon himself. The Barred Owl, a male we call “Zen,” was unusually calm and alert on arrival. In my initial exam I could feel unnatural movement in the elbow joint of his left wing. Any injury in the area of a joint is serious, but I could not feel a fracture. It was Monday, so I called my vet, Dr. Barb Stastny at Opossum Pike Vet Clinic, and arranged to bring the Barred owl, and the juvenile Red-shouldered Hawk with the infected foot, to her for examination. The owl’s X-ray showed some separation in the joint, probably from the swelling, and possibly a “chip” fracture at the tip (olecranon process) of the elbow. We started him on NSAID drugs to alleviate the pain and inflammation. We will keep him quiet, on cage rest, for a couple of weeks, and gradually begin some gentle physical therapy to try to prevent stiffening in the joint that would limit range of motion. Dr. Barb did not like the look of the Red-shoulder’s foot anymore than I did, but we decided to try him on antibiotics and pain meds for a week, soak his foot daily and keep it in a ball bandage, and see how he responded. Unfortunately, the foot barely improved even with these intense treatments. It remained deformed and he could not use his toes at all. I brought him back to Dr. Barb and she took X-rays. We found that the infection had entered the bones of his digits and two of the digits were luxated. Sadly, nothing we could do would give him back the use of that foot, and he would continue to suffer severe pain. We made the humane decision to euthanize him. Meanwhile, Zen’s injured wing seems to be improving. We don’t want him using it at this stage, so we can’t test his flight, but he flaps it now when he can get away with it. The elbow is still swollen, and though range of motion in the joint is restricted now, we are cautiously hopeful that Zen could yet regain full flying ability. We will continue to keep him quiet and do gentle physical therapy, and give him more time to recover. 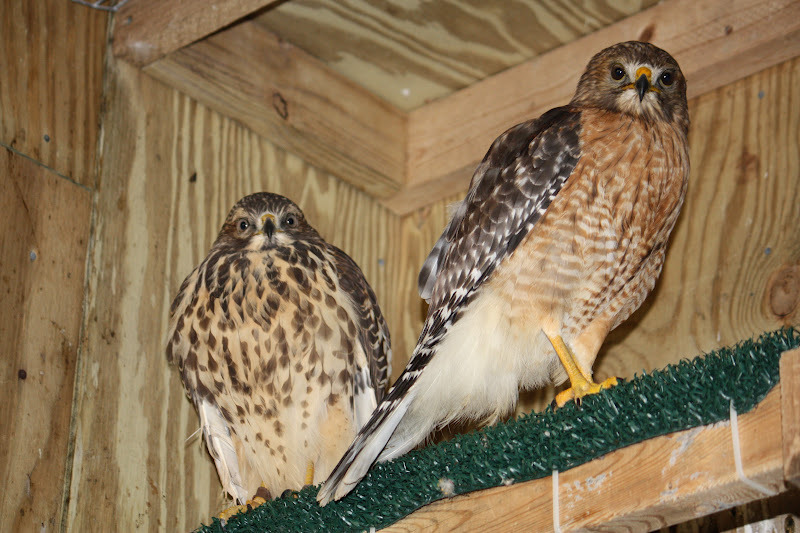 Sonya, the adult female Cooper’s hawk that impacted with a car three weeks ago, is still on the mend. I took her back to Opossum Pike Vet Clinic last Friday, March 9, for follow up X-rays. Dr. Barb had hoped that the compound fracture in her left leg might have healed enough to remove the pin, but while a callus is forming, it has not completely “bridged” at one of the fracture sites, so she left the pin in place and replaced the splint, to keep the leg immobilized. We will return after two more weeks to have the pin removed. Both Sonya and I will be very relieved when she can tear apart her food and eat on her own again! Tomorrow I am off to Baton Rouge, LA, for the 2012 National Wildlife Rehabilitators Association Symposium. I will watch and listen to presentations by rehabilitators, veterinarians, biologists, and educators from all over the country about many topics of concern to wildlife rehabilitators. This year there is a session devoted to reuniting and fostering baby birds and mammals, a topic near and dear to me. I always learn so much at these symposiums, and come home feeling renewed and invigorated. It comes just in time to take on raptor nesting season, which is already underway. Thank you to my husband, Jan, for taking over many of my duties, as well as my friend Kathleen Handley, another wildlife rehabilitator, who will handle any and all medical treatments in my absence. I look forward to reporting back to you all next week. PS. I also get to do a bayou boat tour! Can’t wait! Zen the Barred Owl. Photograph by Suzanne Shoemaker.